Hanging Christmas tree lights may seem like an easy task for the experienced decorator, but did you know that there are three popular ways to properly light your tree? If you’re planning to put an old unlit Christmas tree to good use or simply want to DIY your Christmas tree lights, this post will show you how to do it the right way. Take a look at these three ways to light a tree and choose the one that works best for you. Starting from the top, weave the lights around the tree’s entire circumference, working your way down. When you reach the end of the first light string, plug in the next one and continue until you reach the bottom of the tree. Dim the room lights, step back, and look at your tree from a distance. Squinting will help you identify dark patches on your tree. Fill in these dark patches by arranging lights as necessary. To increase the amount of lights, repeat steps 1-3 as desired. 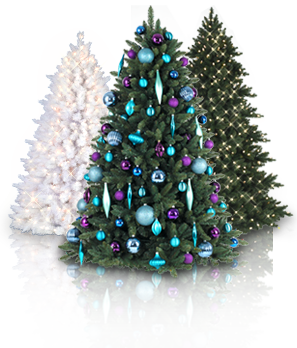 Before hanging your Christmas tree lights, mentally divide the tree into triangular sections, creating three sections around the tree. These sections will be lit separately. Plug in the first light string and place the last bulb on top of the tree. Starting with one of the triangle sections, weave lights from side to side, working your way down. When you reach the end of the first light string, plug in the next one and continue until you reach the bottom. Repeat step 3-5 for the remaining sections. Starting at the bottom of the tree, hang lights along each of the branches. Wrap each individual branch with lights, working your way up and around the tree. When you reach the end of the first light string, plug in the next one and continue until you reach the top of the tree. The next time you find yourself with an unlit tree, remember the methods listed here to help get you started on stringing your Christmas tree lights. What lighting method have you been using on your Christmas tree? Share them with us in the comments!